NGA Recent Acquisitions 1974, no. 22. NGA Master Drawings 1978, p. 46-47. Felipe II: Un Príncipe del Renacimiento. Museo Nacional del Prado, Madrid: 1998-1999, no. 165, repro. 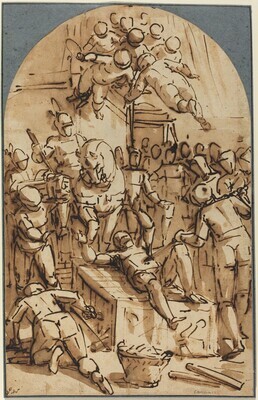 Luca Cambiaso, 1527-1585, Jack S. Blanton Museum of Art, University of Texas at Austin; Palazzo Ducale, Genova, 2006-2007, no. 102. Walker, John. National Gallery of Art, Washington. Rev. ed. New York, 1984: 666, no. 1054, color repro. Martinez, Benjamin and Jacqueline Block. Visual Forces: An Introduction to Design. 2nd edition, Englewood Cliffs, NJ, 1995: 63, fig. D.